It’s always exciting to try a new lunch spot, specially when the food reminds you of home, well ok, maybe not home (my home town of Buenos Aires), but our neighbors to the west, Chile. 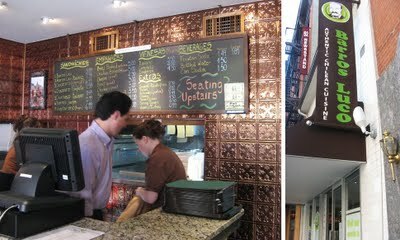 Owner Carlos explained how he always loved these sandwiches growing up, which are actually named after Ramon Barros Luco, a former Chilean president who ordered a steak and cheese sandwich so often that when he passed away, they named it after him. 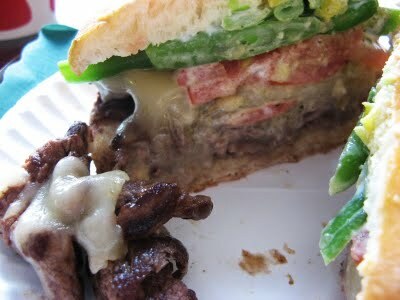 The sandwiches come in a soft homemade bread with your choice of steak or chicken. 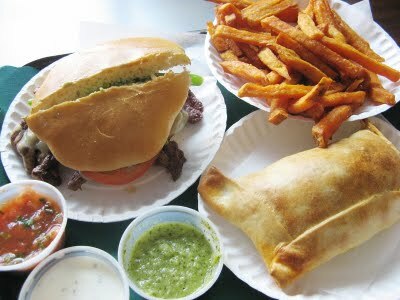 Knowing me, I went for the beef of course, #4 Chacarero Completo, a Beef Baked Empanada and a Sweet Potato Fries. The fries were really addictive, crunchy on the outside, warm and soft on the inside, to be dunked in their homemade dressing which was sort of like a blue cheese, did I mention these are super addictive? Good thing sweet potato is nutritious and good for you, maybe not fried, but whatever, they were good. All this was enough to be shared. 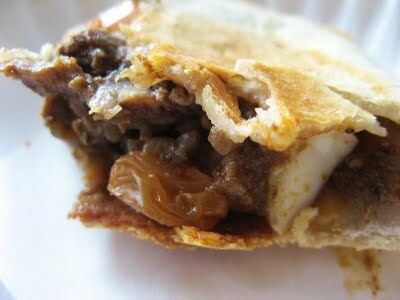 Beef Baked Empanada was very similar to the ones I had in Argentina growing up, minus the raisins, which I didn’t mind. This reminded me of a local restaurant in BsAs, but up a notch since they used beef cubes instead of ground beef, gracias Carlos! muchas gracias! The well seasoned beef was mixed with eggs, onions and raisins, very juicy, hidden inside a thin and crunchy square, I’ve never seen a rectangular empanada, but I’m not complaining, as long as it works. The juices were dripping out, all good… all good. It came with a side of Pebre sauce (chopped tomatoes, onions, cilantro, aji rojo and garlic), by reading the ingredients you can guess, it’s like a joker in a card deck and goes with everything, it had a nice smokey flavor that I loved, great with chicken or beef or just by it self on bread, hmmm… where can I get me a jar!? But seriously, the empanadas had enough flavor, it didn’t even need any sauce. #4 Chacarero Completo with beef, I would usually prefer my beef to be more on the rare side, but this is fast foodish, so I left my steakhouse expectations at the door. The sandwich came loaded with usual things like tomato, pepper, cheese, avocado, but also string beans which was odd, but added a surprising crunch, the bread is toasted and warm, with a thin layer of Aji Verde (Chilean Green Chili Sauce), I ordered an extra aji verde sauce, and boy, was it good, dipping the sweet potato fries in it was like being in flavor land, on a taste ride featuring garlic, cilantro and jalapenos… again, where can I get a bucket of this stuff? It would go well with anything, then again, doesn’t garlic make everything better?… Think the Stinky Rose in San Francisco, they built a whole restaurant and it’s menu around it. Everything was finger licking good, move over Quiznos, there’s a way better toasty sandwich in town that deserves the tagline “mmmm toasty… and delicioso!”My only wish was to have something other than sodas to drink, there must be a more local Chilean drink, or even a imported soda or something.